The landscapes of postcards and the landscapes of the heart are not always one in the same. 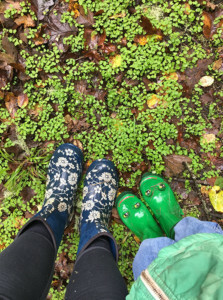 This idea took hold of me this year just as the leaves yellowed on rows of grapevines in wine country and the rains returned and we found ourselves drawn, once again, to the woods behind the Our Lady of Guadalupe Trappist Abbey in Carlton. We went there to walk the trails, which lead out from a chapel and retreat center circle past a small pond before heading up the hill to a grove of white oak set on a restored prairie savanna. I don’t think anyone has ever sent a postcard from a native oak habitat after visiting the Willamette Valley, but perhaps this is a mistake. The oak savanna holds nothing of the jaw-dropping drama of a woodland waterfall or the sheer life-or-death presence of a craggy cliff-side. It is a place where you feel less at odds with the land than at peace with it. To visit the savanna means to convene with the vestiges of the Ur-Oregon, a place thick with life, a tiny, ancient island among the landscapes of agriculture and industry. 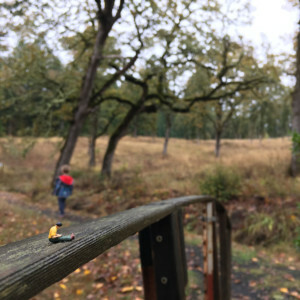 Where once they covered the landscape from the southern valley through British Columbia, now native oak habitat represents less than 1% of the land area in the Willamette Valley. On our most recent Abbey hike, we had caught the woods in a moment of transition, at the odd autumn moment when the waning of sunlight heralds not the disappearance, but the return, of green. 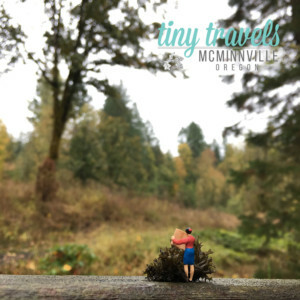 As we walked towards the hill behind the retreat center, the woods brought forth its unmistakable perfume of peat, wet ground cover and bark, the kind of specific smell that can only emerge at this place and time. The day was just dreary enough twigs on the bushes lining the trails seemed to disappear into the background, leaving what looked like green lace waving around our feet. All over the forest floor, tiny ground cover plants made a carpet sprung through with mushrooms. My children know this place well. 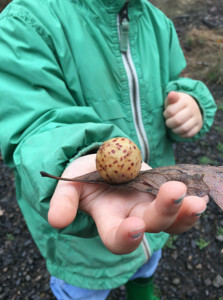 For the kids, their gaze still so close to the ground, it’s a hunt for worlds as big as their hands can hold, a chance to trace the methodical lurch of the slug across a tree trunk, or to hold a gall puffed up on a fallen oak leaf. We got lost that day at the Abbey. I don’t mean metaphorically lost, though that’s a feeling I know well. I mean real, can’t-find-the-exit lost. The path we always took had been grown over with grass. Our new trail had sent us deeper into the conifer woods encircling the property. We reached the point where the children were sure we were headed out on some doomed Hansel & Gretel operation. They had begun scanning the ground for moonstones just as we assured them that the thing we sought was always just around the next bend. Until I stopped looking for a marked path and set my inner compass to the oaks. When they were finally in our view again, they slayed me anew. These oaks, old as the hill, seem to be carrying the ponderous weight of time on their branches. As time passes, the oaks become, well, oakier. More like themselves. Really, there is nothing more I want out of aging than this — to be more like myself with each year, always on my way to the one true form, never arrived, holding on until it’s time to let go.